కావున క్రింది Live E-Filing AY 2018-19 వీడియో చూసి మీ Income Tax E-filing మీరే mobile లో Free గా చేసుకోవచ్చును, Tax పడనివారు TDS తో సంభంధం లేదు కావున Tax పడని వారు Efiling ఇప్పుడే చేసుకోండి. TAX పడినవారు DDO గారు TDS చేసినతర్వాత మాత్రమే E FILING స్టార్ట్ చేయండి. TDS చేసేలోపు మీ e-Filing Application ని Draft గా save చేసుకొని Ready గా ఉంచుకోండి.TDS complete అయిన తర్వాత final submit చేయండి. Step 1: Register yourself at the Incometaxefiling.gov.in website. 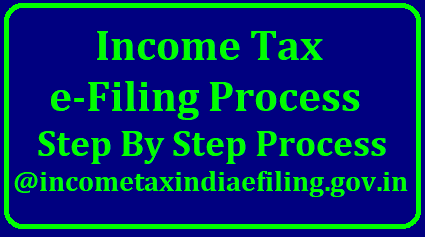 Step 3: In e-File Section, Click on "Prepare and Submit Online ITR"
Step: 8 Keep the Values that are being shown in the columns in Column No 28 you will be ask for AADHAAR and PAN Details and Save Draft. Now Click on the the Arrow Button to Move the Next tab " Income Details"
Step 10: Deductions under Chapter VI A which covers 80C 80CCC 80CCD1 80CCD1B 80CCD2 80CCG 80D 80DD 80DDB 80DDB 80E 80G 80GG 80GGA 80GGC 80RRB 80QQB 80TTA and 80U. Once you fill relavant columns in the deductions and taxable Total Income will be displayed. Tax Computation will be automatically done and the Total Tax and Interest will be shown in column No D12. Click Save Draft and Click the next arrow button. Step 13: Check you Details entered by you double check each and every field and entered and cross check with the computation sheet that you have ready with you. You are good to go now. Click Preview and Submit Button and Click Submit. Your Income Tax Return for the Assessment year you have choosen will be submitted. Last and important verify your return.